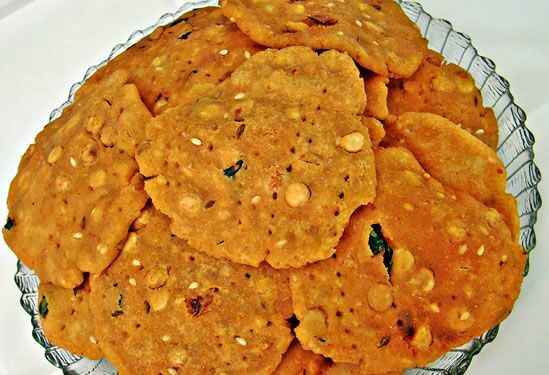 Thattai is a crunchy, deep-fried snack popular across South India, especially in Tamil Nadu. Prepared during festivals and special occasions, they are also an ideal teatime/evening snack. 1. Soak the rice in water for an hour. 2. Drain well and grind to a thick paste. 3. Dry roast the urad dal and grind to a fine powder. 4. Grind the ingredients for masala. 5. Combine all the ingredients and knead well to a soft, smooth dough. 6. Cover and keep aside. 7. Pinch small lemon-sized balls of the dough and using greased fingers spread it into a small puri (thattai). 8. Using a fork gently prick to make small holes. 10. Fry the prepared thattais until golden brown and crisp. In some places grated coconut is also added to the masala. This dough can also be used to make murukkus, thenguzhal or ribbon pakodas. Feel free to comment or share your thoughts on this Masala Thattai Recipe from Awesome Cuisine.